Leah Hogsten | The Salt Lake Tribune James Evans, former chairman of the Utah Republican Party directs elections at the Salt Lake Republican Party organizing convention, April 13, 2019 at Cottonwood High School. 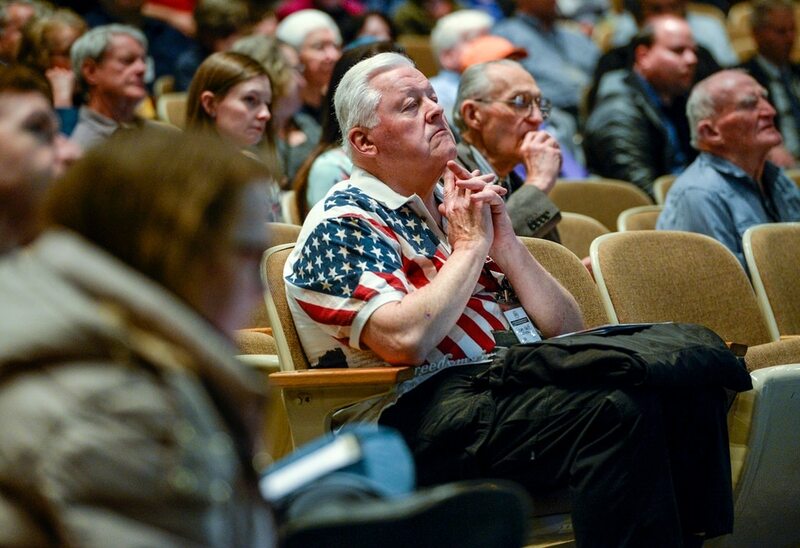 Leah Hogsten | The Salt Lake Tribune Ted Neff of South Jordan waits for voting results for the party secretary at the Salt Lake Republican Party organizing convention, April 13, 2019 at Cottonwood High School. 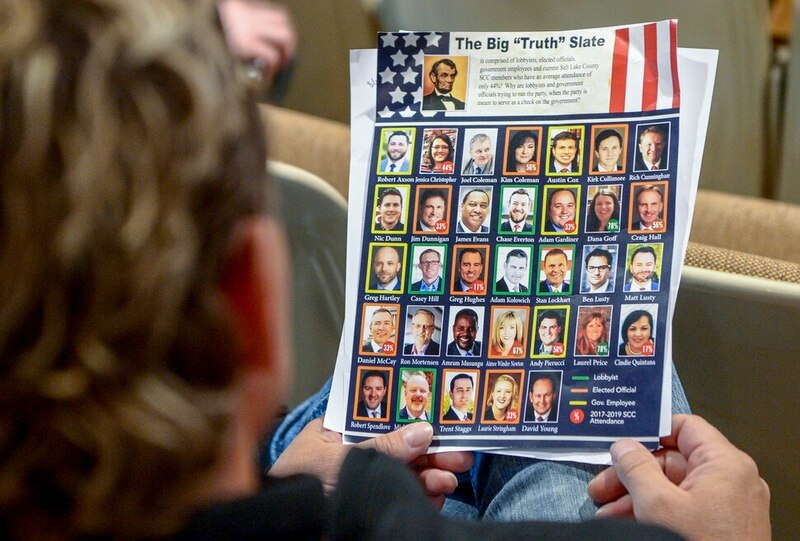 Leah Hogsten | The Salt Lake Tribune A delegate holds a flyer detailing the Salt Lake County State Central Committee members and their attendance rates at the Salt Lake Republican Party organizing convention, April 13, 2019 at Cottonwood High School. The flyer read, Why are lobbyists and government officials trying to run the party, when the party is meant to serve as a check on the government? Leah Hogsten | The Salt Lake Tribune Delegates cast their votes at the Salt Lake Republican Party organizing convention, April 13, 2019 at Cottonwood High School. Leah Hogsten | The Salt Lake Tribune Vehicle in the partking lot at the Salt Lake Republican Party organizing convention, April 13, 2019 at Cottonwood High School. Utah Republicans have been experiencing tumultuous times — a congressional district and several state legislative seats turned blue in the 2018 election, their party infighting has made headlines and some worry their messages aren’t resonating with young people. Now, competing factions are struggling to take control of the Utah GOP and put it on firmer ground before the next statewide election. On one hand are purists who blame the party’s woes on a weakened caucus-convention system and a gradual drift from conservative principles. On the other are sitting officials and establishment Republicans who want to move past divisive debates over the election process and refocus on aiding GOP candidates. Newton was among about 60 county residents at the convention vying over 29 spots on the state central committee, the body that will help steer the party for the next couple of years. 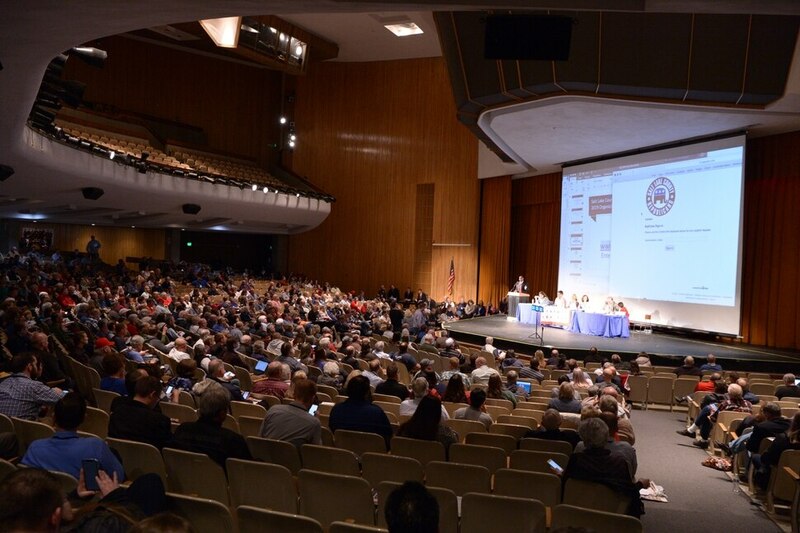 To vote on these positions, more than 700 county delegates packed into the Cottonwood High School auditorium, many clutching stacks of flyers that advertised the candidates and separated them into slates of allies. For instance, there was the “Big Tent Slate,” a 31-person group that included Newton, six sitting state legislators, a couple of Capitol Hill staffers and former House Speaker Greg Hughes. "I think there's a big desire amongst elected officials to get our party to help lead the charge on getting Republicans elected," said Rep. Jim Dunnigan, one member of the slate. "The state party has not been as helpful as they might be because of all the infighting." Right now, many GOP meetings devolve into disorder and bickering, Dunnigan said, arguing that this internal drama reduces the party’s overall effectiveness and alienates grassroots Republicans. “There’s a strong desire to reclaim our party and have it function well again,” the Taylorsville lawmaker said during an interview at Saturday’s convention. But putting government officials in party roles is a problem for Cherilyn Bacon Eagar, who billed herself Saturday as a grassroots choice for reelection to the state central committee. “I think it’s a serious conflict of interest to have elected officials on a state central committee, which is the governing body of the party, that is supposed to be the check on elected officials,” she said. First voted onto the central committee two years ago, Eagar and likeminded party members have fought tooth and nail against SB54, the 2014 election law that allows candidates to qualify for the ballot by collecting signatures and/or through the traditional caucus-convention system. The Utah Republican Party waged a lengthy legal battle seeking to reinstate the caucus system as the only path to election but ultimately failed to persuade federal judges to overturn SB54. Though the case fizzled earlier this year, Eagar said the state party shouldn’t give up, perhaps pressing forward by convincing legislators to scrap the signature path or by filing another lawsuit. Some Republicans view the SB54 battle as a distraction, pulling the party away from its core mission to put GOP candidates in office. But Eagar says Republicans are losing seats because of a hostile media, an "increasingly liberal" state legislature and the signature path to the ballot. Her flyer encouraged county delegates to support “grassroots” central committee candidates such as Helen Redd, an incumbent member who helped manage the party’s lawsuit against SB54. Redd said the signature path to the ballot has undoubtedly weakened the party caucuses and she predicts continued efforts to quash the dual pathway. But while SB54 is the law, she’s not in favor of stripping election candidates of their party membership if they choose to collect signatures, a more radical idea that has surfaced inside the GOP. Speaking to the Salt Lake County delegates, Lt. Gov. Spencer Cox exhorted fellow Republicans to unite around the mission of bringing young people into the fold. Newton, Dunnigan, Hughes, Eagar and Redd each landed one of the 29 state central committee seats up for grabs Saturday. Since each local party elects members to the committee, the final makeup of the roughly 180-person state committee won’t be decided until later this month, when the county organizing conventions are complete.